Zero Carbon Malaysia proudly present a new Engine cleaner that will eliminate carbon deposit inside your engine and exhaust system. ZERO CARBON is a decarbonizer that will reduce your fuel consumption and increase your car performance just like when you newly received your car. Zerocarbon .my is the official website for you to get instant info regarding our product and you can buy it directly through this website. 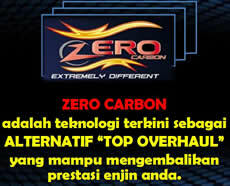 For more info or any enquiries, you can drop us some text on the contact us via zerocarbon .my official page.